Every year in January we attend the Shooting Hunting Outdoor Trade show. 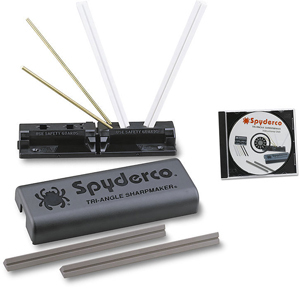 Here is the Spyderco news! The fluted titanium military will be delayed because the coloring process is being changed. There will be a flat ground version of endurance and delica in plain edge with black handles. Chinese Baliyo pens are delayed because of QC issues. Matriarch C12sbk will have an Endura handle and mini model C162sbk. Sp14sbk is being upgraded with 4 way clip, skeletonized liners and beefier blade. Cricket will be offered with glass fiber handle. Caly 3.5 in carbon fiber. There will be a C146CLP Szabo folder in the summer. A titanium handle with 3v blade msrp 399 . 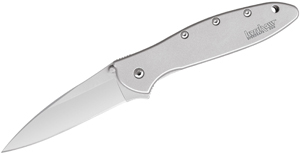 Then there is a stealth chaparral with titanium handle C152. Steel will be XHP carpenters steel. Pink squeak with portion for breast cancer in the summer. Lionspy will be in soon! 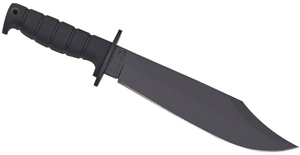 Ulize is about a police model size with G10 handles and the blade is almost wavy, slightly recurred blade regular item. Man bug will be available in ZDP steel late summer green handles. Caly 3 carbon fiber and Damascus September delivery. Every January the Shooting Hunting Outdoor Trade show is held in Las Vegas. We bring back all the news so you’ll have an idea as to what’s ahead this year in the knife industry. Columbia River: They are offering the Ripples in an aluminum handle with liners. The action is still fast. The m16 series will be available as steel handled frame locks. Kommer models include orange handle two shot folder and the Free Range line of low cost hunters. Also a “surf n’ Turf folder for fish or all around camping. Their new multitool has switchblade style screwdrivers wrenches and blade and more. Price will be 49. Folts minimalist with a wharnclifff blade. Heiho assisted model with smaller size. M2112 in desert tan. Leong Mah Eraser folder with a bolstered handle with g10 in tactical or satin at retail of 140 and 150. Plus a rescue m16 with orange handles and seatbelt cutter built into the flipper. There is also a key chain sharpener with a few tools designed by Tom Stokes. SOG has some great new entries for 2012. Tool logic has a key knife with a lock back. They have a light, the transforma, which holds knife blade, scissors, fire starter, eyeglass screwdriver and works on one aaa battery. Also a pocket clip. SOG has a new multitool the power duo that will retail for about $80. Plus 2 flashlights with great led bulbs and great pricing. The name for the line is dark energy. They have several knives with built in lights. The fixed blade is called the blade light. The folder also has 6 led bulbs and has a nylon sheath. The Slim Jim is the thinnest assisted opener they can make. It has aus8 steel blades. It has a pocket clip, safety and 2 sizes for now. These are great folders and will be very easy to carry and will solve the issue many people have with pocket knives- that they are just too bulky to carry! Also a resue knife which is not assisted and will be available in black or bead blasted blade. The sogzilla will be available in a slip joint model with a 3.2 inch blade. Their tomahawk will be available in a polished version. They have great molded sheaths or nylon available and we will offer both.